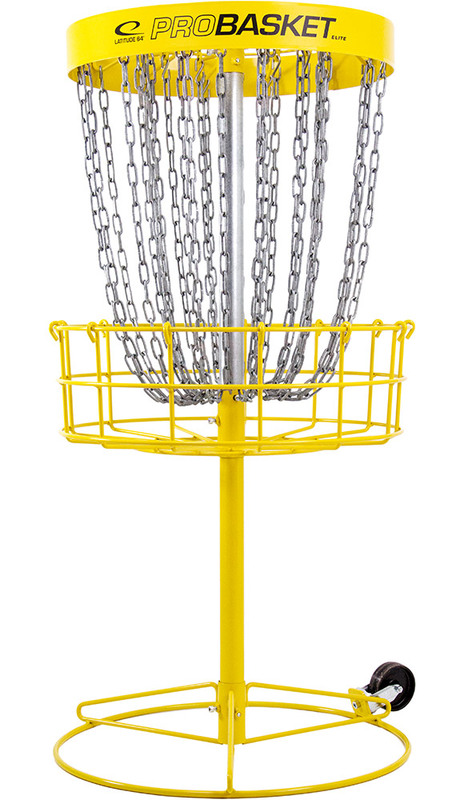 The Latitude 64° ProBasket line-up is arguably among the toughest and best looking Disc Golf targets out there. The baskets are produced in high quality materials for optimal durability, regardless of weather and continuous use. Functionality, longevity and looks, all in one package. 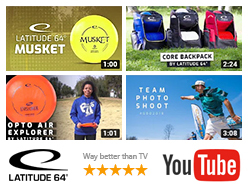 The Latitude 64° professional tournament basket. Made to withstand the elements and the best choice for any permanent disc golf course. The double chain set consists of 14 inner and 14 outer chains which gives it a “softer edge”, and increases the chance for discs to “stick” to the chains. This also ensures that putts don’t slip through the chains, and likewise hitting the pole causing frustrating ”spit outs”. The yellow 4” tall deflector band on the top rim improves visibility in all conditions, and the chain sliders on the inside steers the chains in a zig zag pattern which also makes the basket even less sensitive to ”spit outs”. • 14 inner and 14 outer chain sets made of galvanized steel. 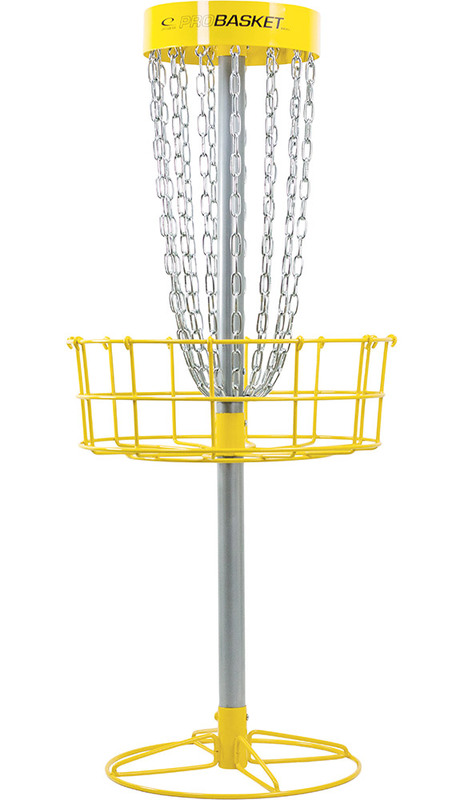 • The ProBasket Elite has a powder coat finish. • Yellow 4” tall deflector band improves visibility in all conditions. • The ProBasket Elite has welded nuts for easier assembly. 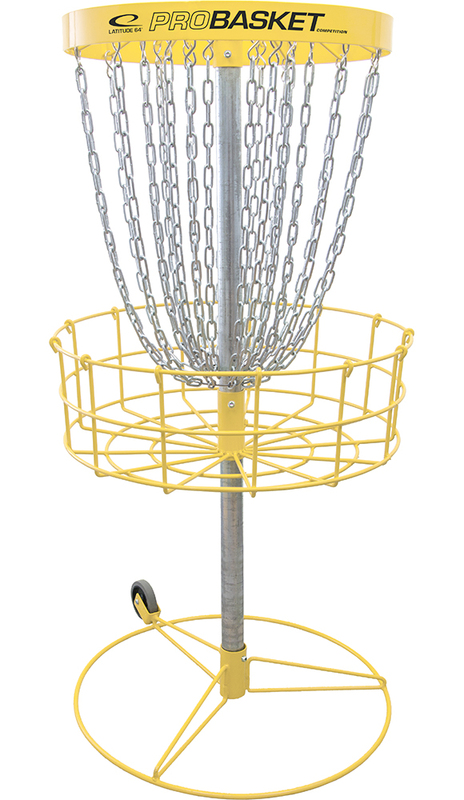 • The ProBasket Elite is approved at the Championship PDGA level. The ProBasket Competition is one of the best championship level approved baskets on the market in it’s comparable price range. A high end basket for an excellent price and in the same top quality standard as our ProBasket Elite. 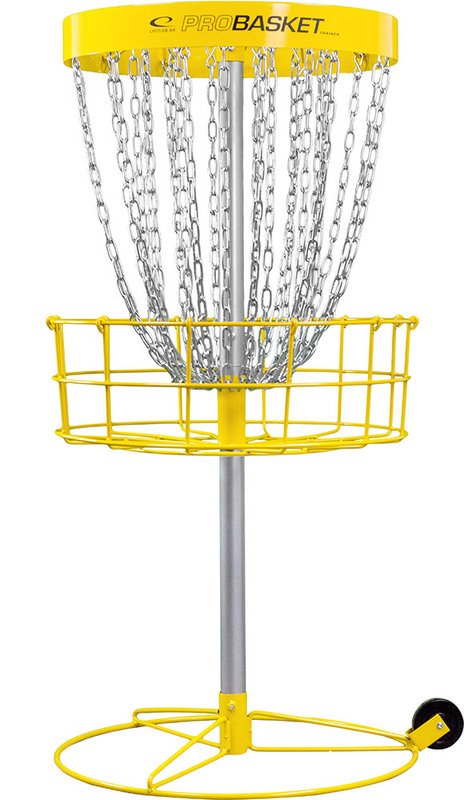 Fitted with 26 galvanized chain sets and produced with the same superior workmanship that Latitude 64° consistently produces, the ProBasket Competition will grab your putts and serve your course for years to come. • 13 inner and 13 outer galvanized chain sets. • Galvanized with a yellow powder coated finish. ProBasket Trainer is a solid quality basket for home use that is easily assembled. Unlike many low priced baskets this has the look and feel of a tournament basket making practice feel like the real deal. It can also be used for temporary courses, where the built in base wheel makes it easy to move. It is PDGA approved for events up to B-tiers. • 13 inner and 13 outer chain sets that are zinc coated. • The ProBasket Trainer has a powder coat finish. • The ProBasket Trainer is approved at the Standard PDGA level which grants useage in events up to, and including, B-Tier. • The ProBasket Trainer pole is divided in two parts for easy transport and storage. • The ProBasket Trainer is mainly meant for portable use. Meaning permanent installation, or prolonged exposure to the elements, can eventually compromise the integrity of the basket’s composition.